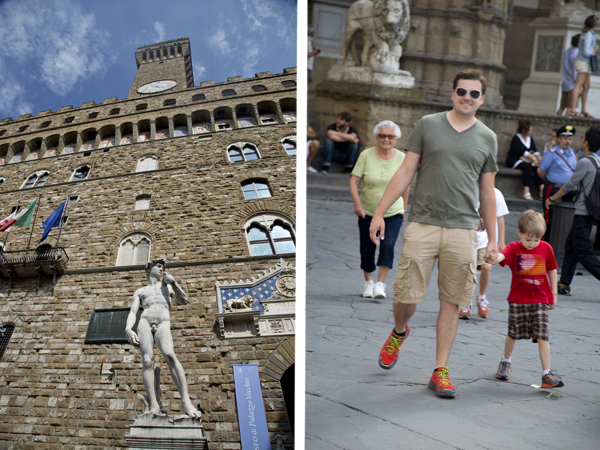 Welcome to the third (and final) installment of the Florence leg of our trip. 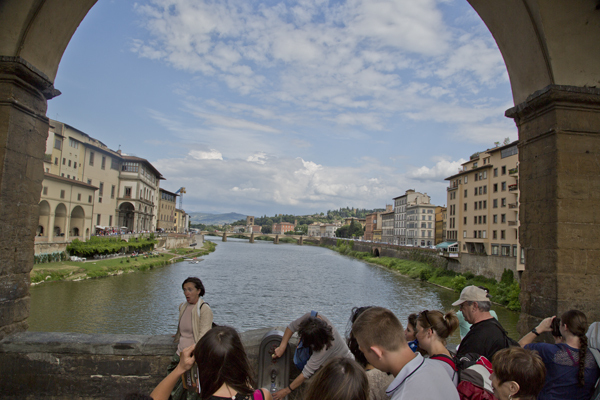 Like I said before, Florence was my favorite city in Italy, so I had a hard time whittling down all of the pictures. 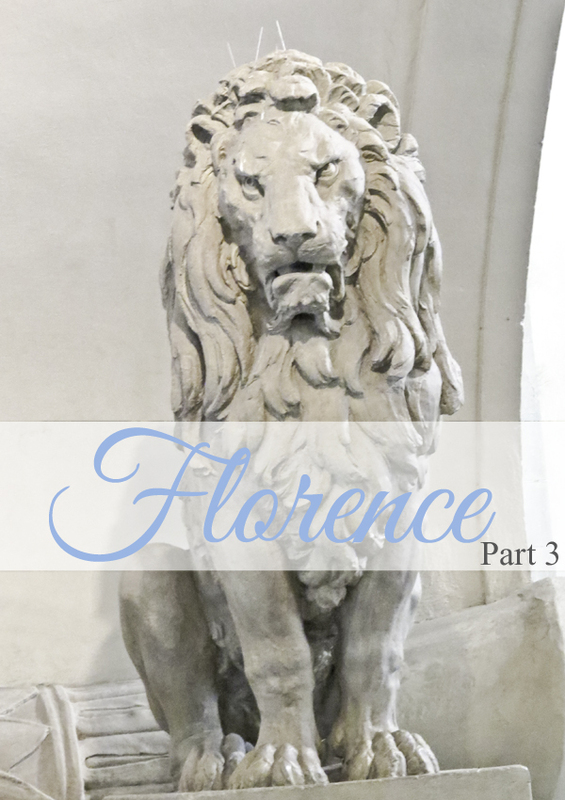 Today’s set is going to be just as jam-packed with photos as the last two so if you’re not big on excessive shots of Florence, you might want to skip this post. 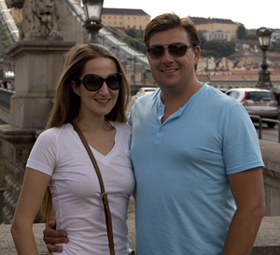 For the rest of you, here are some more snippets of our trip. 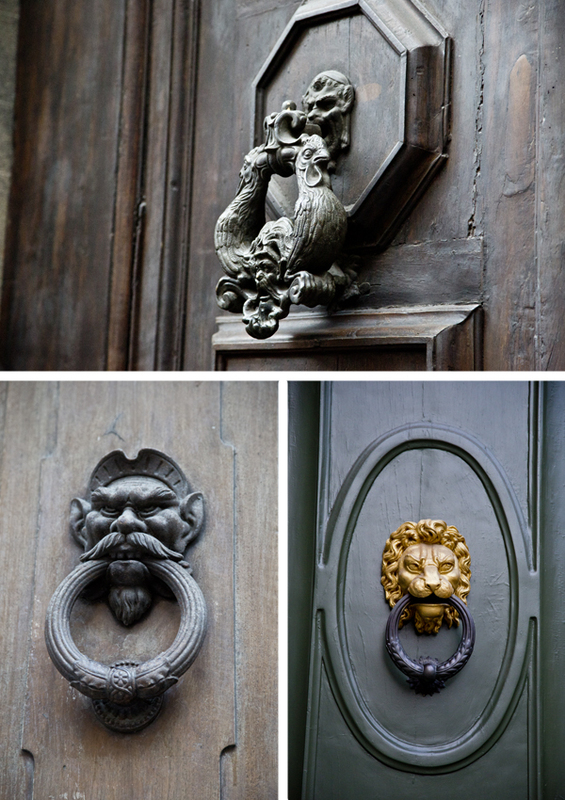 I seriously took hundreds of pictures of door knobs. These are some of my favorites. Sometimes being jet-lagged can be advantageous because you’ll find yourself awake long before anything major is open and that will give you the opportunity to go exploring. 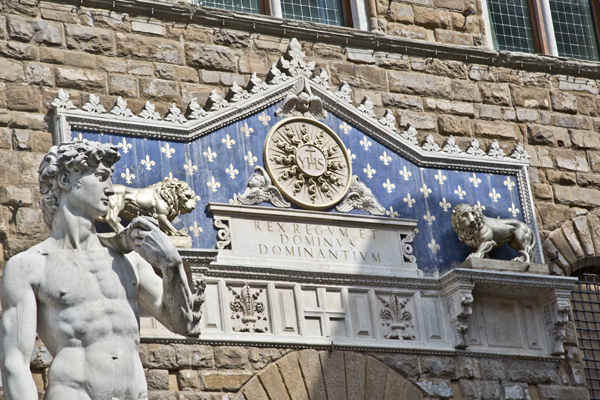 On one such morning we discovered Badìa Fiorentina, a Monastic Community of Jerusalem on the Via del Proconsolo that is home to a congregation of monks and nuns. 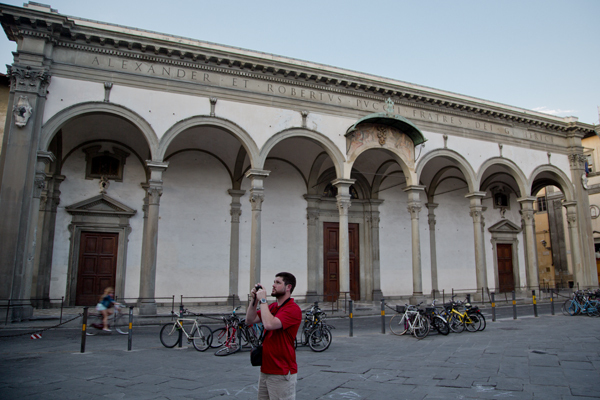 Here’s a fun fact: Dante Alighieri supposedly grew up across the street (this was very exciting to Mat since he was the only one of us that had actually read Dante’s The Divine Comedy – it’s on my list… I just haven’t gotten to it yet). 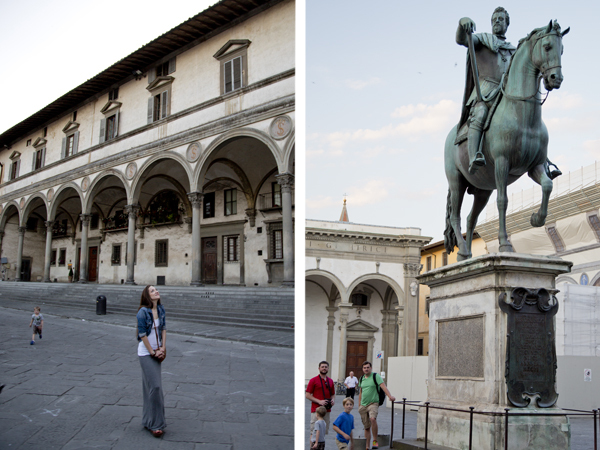 That was one of the cool things about Florence; you get to walk down the same streets traversed by some of the most important masters of art and literature! 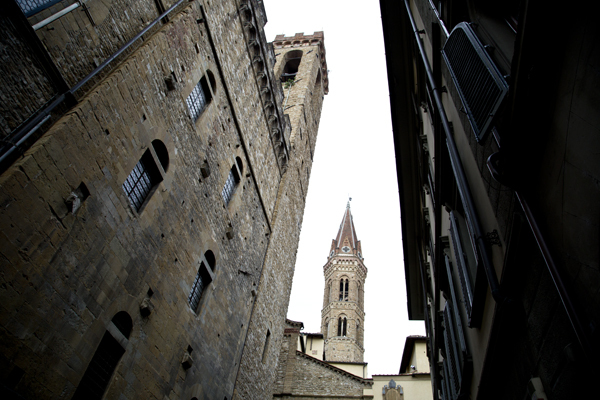 Bell tower of the Badia Fiorentina from the street. 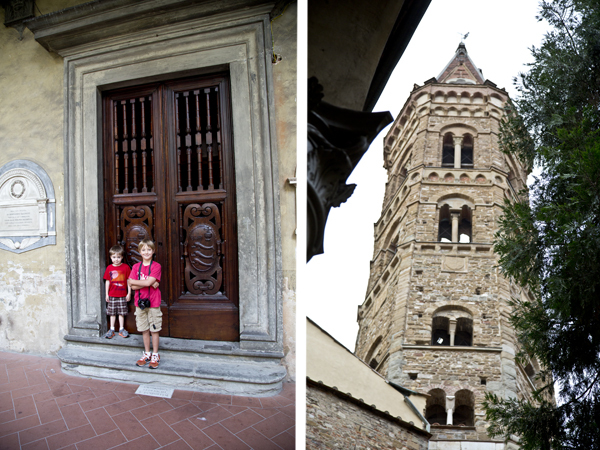 The boys waiting patiently against some gorgeous doors and a view of the bell tower from the courtyard. 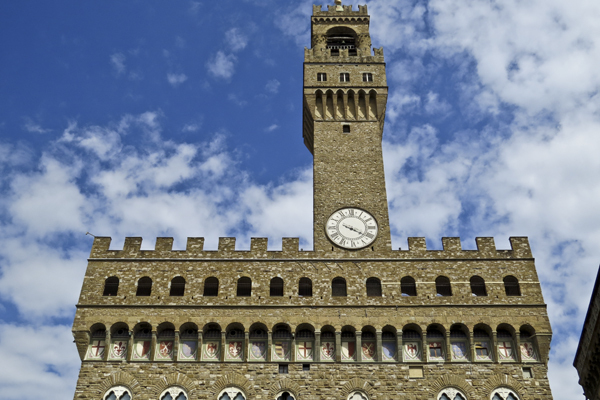 The Galleria dell’Accademia di Firenze or simply, The Accademia is a must see in Florence. 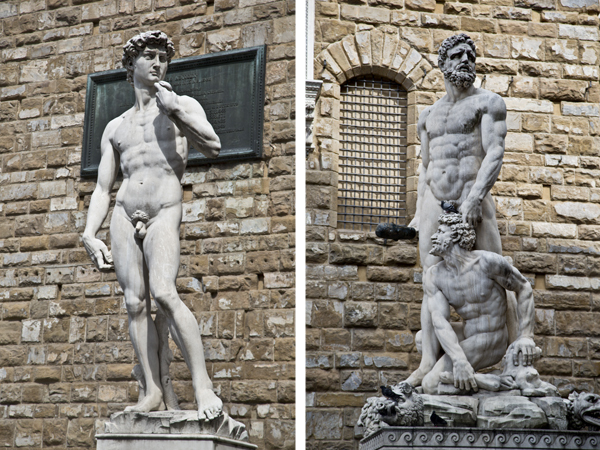 The museum houses Michelangelo’s famed statue of David (or as my younger son calls it, “The Statue of the naked Dave”) as well as several other prominent works of art. I didn’t think I would be all that impressed with the statue as I had seen replicas everywhere from London to Vegas and even Forrest Lawn Cemetery but seeing the actual statue in person is unbelievably surreal. It is far superior to any of the replicas (and I honestly didn’t think it would be but I’m the first to admit it when I’m wrong). We had a reservation to get into the museum and we were so thankful because it allowed us to bypass the line that was wrapped all the way around the building. Unfortunately you are not allowed to take pictures but we did take a photo of a street artist’s artistic interpretation of the statue. 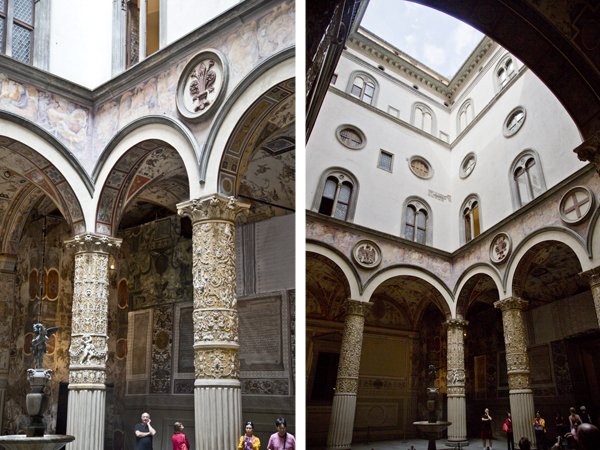 The interior courtyard contains gorgeous frescoes by Giorgio Vasari of Austrian Hapsburg estates and a copy of the fountain “The Putto with Dolphin” Andrea del Verrocchio. 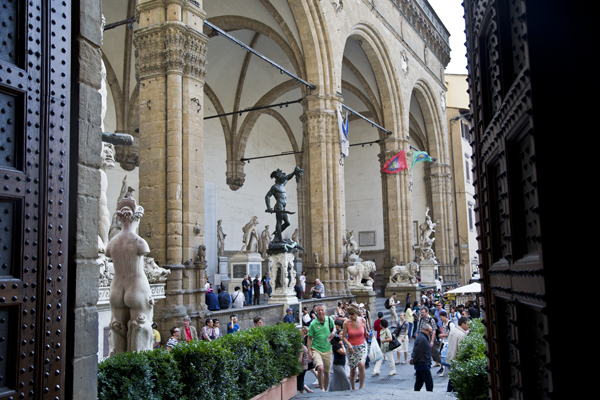 Exiting the Palazzo you get a great view of Benvenuto Cellini’s Perseus with the Head of Medusa which stands in front of the Loggia dei Lanzi (there are so many cool statues in the Loggia and it has a great view of the entire Piazza della Signoria so it is a great spot to sit and people watch). 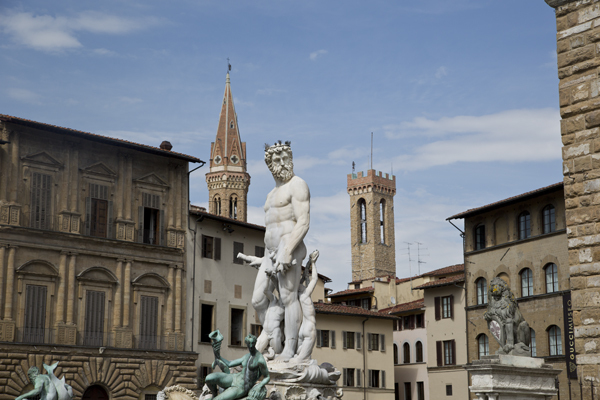 Just outside of the Palazzo is another great piece: The fountain of Neptune by Bartolomeo Ammannati. 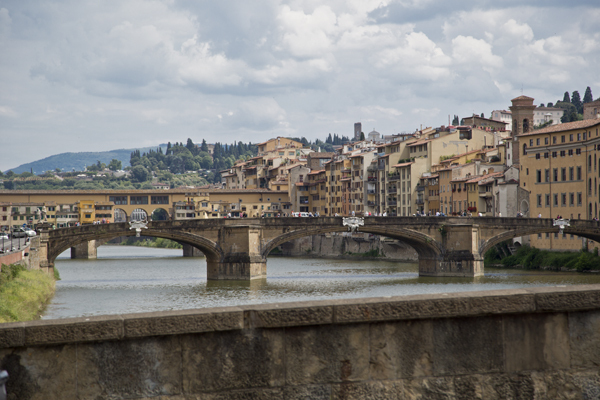 Not far from the Palazzo Vecchio is Ponte Vecchio, or “Old Bridge” which is a medieval stone arch bridge that runs over the Arno River. The bridge is full of shops and kind of reminded me of Venice’s Rialto Bridge. While touring the shops, we encountered an opera singer performing for the crowd. 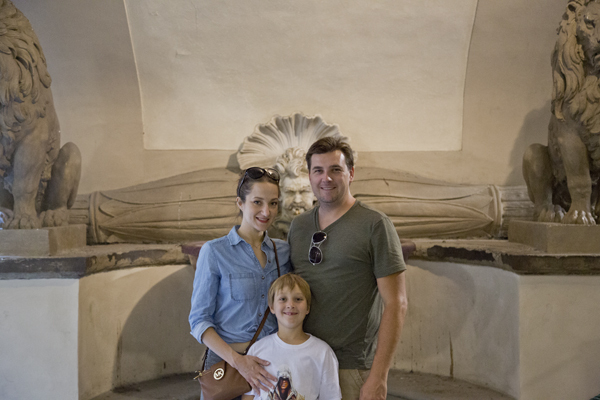 Close to the bridge, we found an awesome 16th century Fountain by Bountalenti in the Piazza de’ Frescobaldi that caught David’s eye (he managed to get a great shot of it). 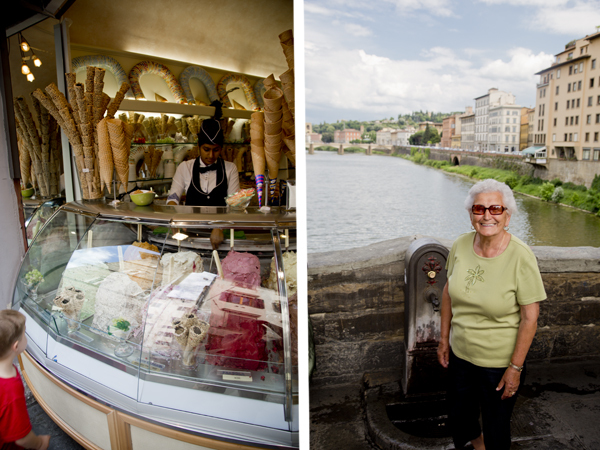 a Ponte Vecchio gelateria selling “tourist” gelato and Dédi posing on the bridge. Seriously, every time we rounded a corner we found something spectacular. 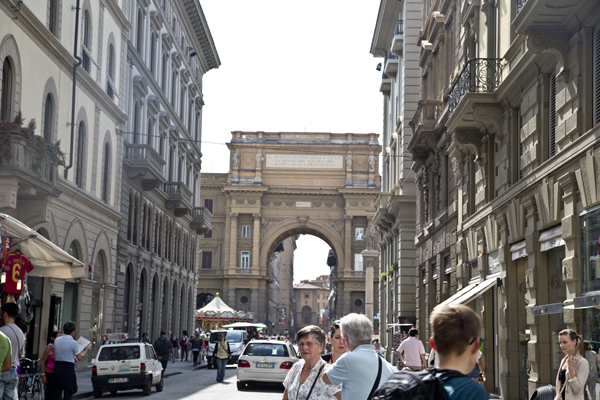 We weren’t looking for the Piazza della Repubblica when we stumbled upon it late one afternoon. 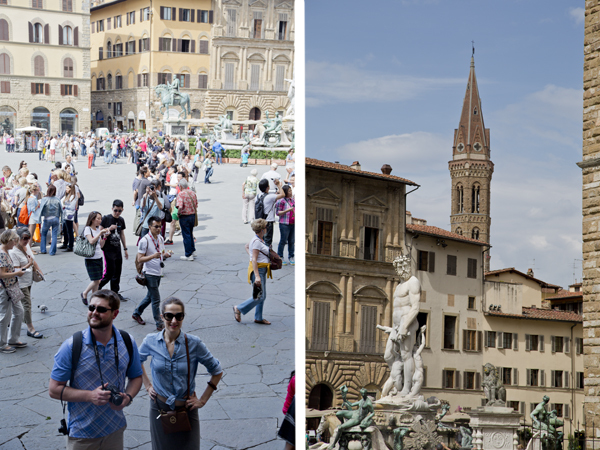 The Piazza marks the forum, or the center of the Roman city. 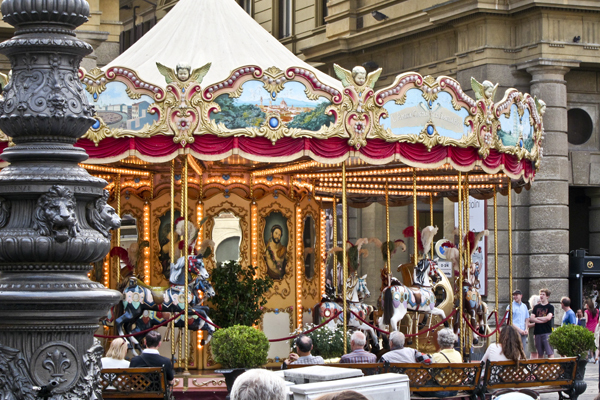 The most noted features of the Piazza are the large Arch of Triumph and the carousel. 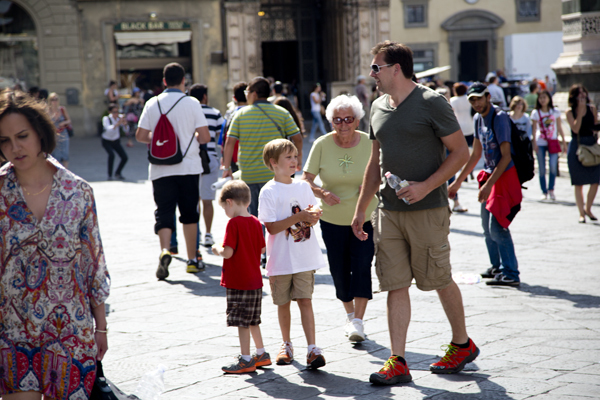 The piazza is also filled with street artists, souvenir vendors and great cafés. Another great spot to watch people! 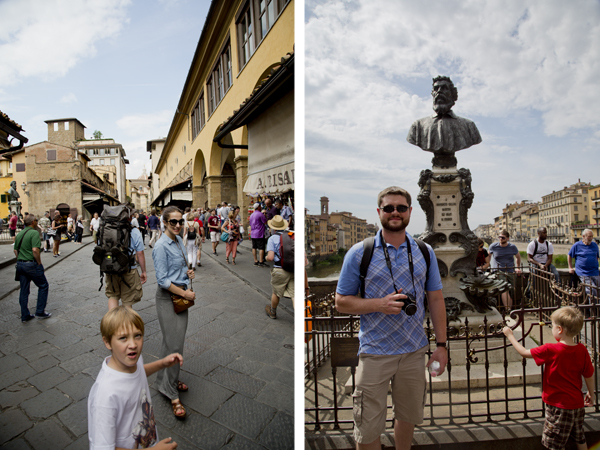 While Mat, David and I were visiting we found some very flustered American tourists who were lost and had apparently not been able to find a single person who spoke English (we were hard pressed to find anyone who did not speak English, but maybe that is because we always tried to speak Italian to them first). We showed them where we were on the map and gave them directions to several points of interest, for which they seemed quite thankful. 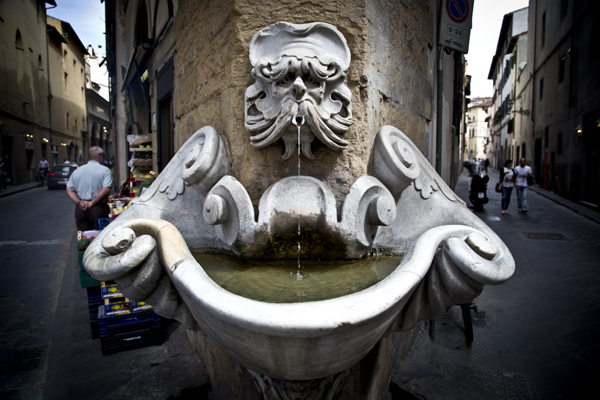 Another gem that we found while on an evening stroll was the Piazza Santissima Annunziata. 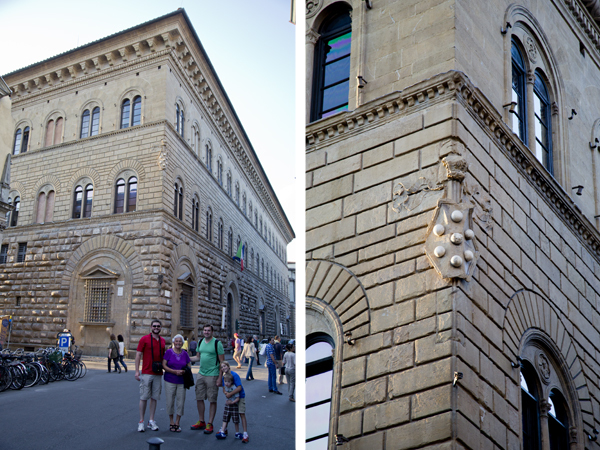 It is one of the most beautiful squares in Florence (I know, I keep saying that but they are all so darn pretty!). 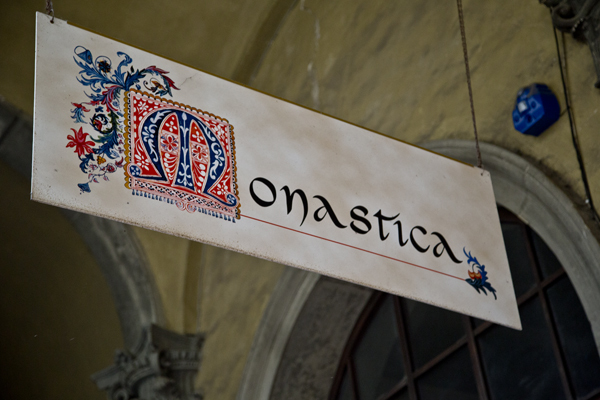 It is home to both Basilica della Santissima Annunziata (Basilica of the Most Holy Annunciation) and Spedale degli Innocenti (Hospital of the innocents – Europe’s oldest orphanage – today it serves as a museum). 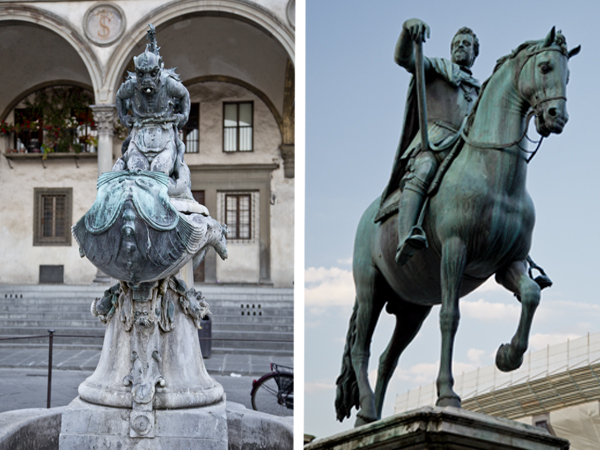 A statue of Ferdinando I de’ Medici, Grand Duke of Tuscany by Giambologna stands at the center of the square next to fountains featuring monstrous mythical creatures that were created by Pietro Tacca. 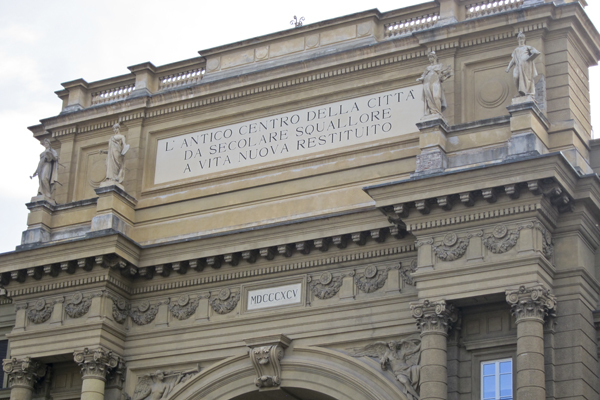 Mat, who is a history buff (he is especially well-versed in all things Italian/Roman history), was excited to find the Palazzo Medici Riccardi (the Medici Palace near the Duomo). 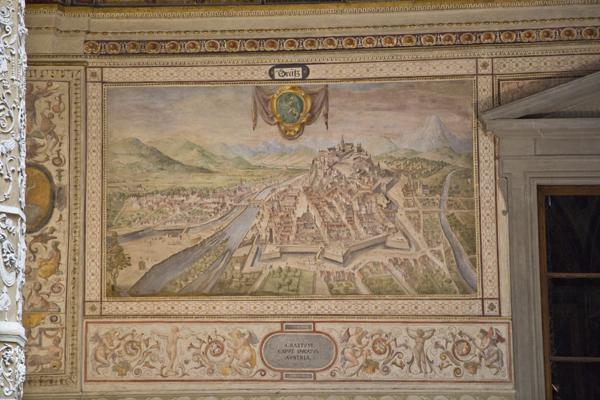 He gave us all an education in everything Medici and by the end of our time in Florence none of us had any trouble identifying the Medici crest. 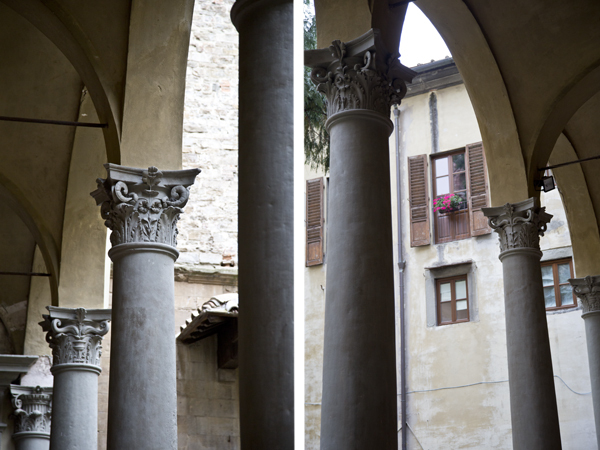 One of the best highlights of Florence (for me and David anyway) was meeting a lovely woodworker who gave us a tour of his workroom and showed off his handiwork. Seriously, as someone in the design field, this was an amazing behind the scene look at the work of a great artisan. 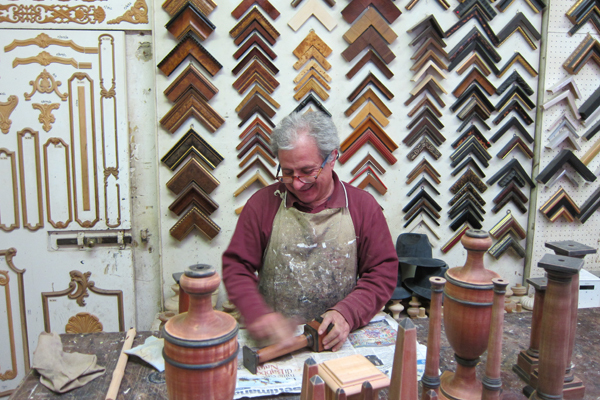 Our meeting with the Florentine woodworker. 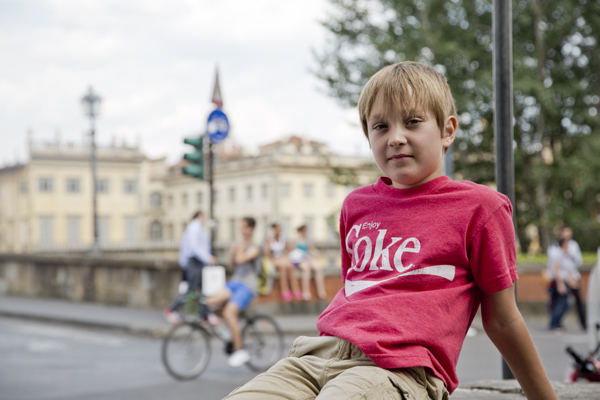 And finally… what fun is it to go to a new place without doing something a little silly? 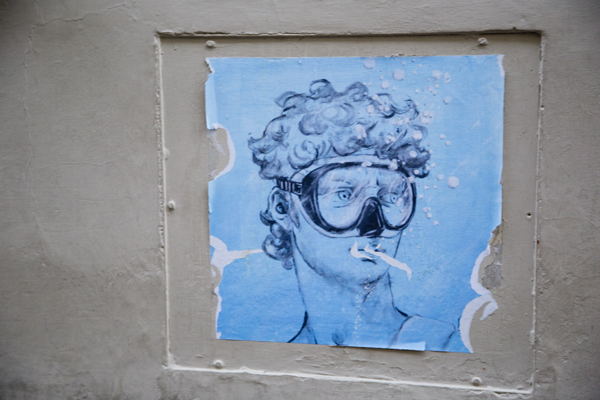 When we were walking down the street our last afternoon in Florence, we saw a sign for something called the “Florence Fish Kiss.” Intrigued by the name, Mat and David decided to peek inside where an Australian couple was having a treatment. So, just what is a fish kiss treatment? Well, you stick your feet into a small aquarium where little tiny toothless fish called Garra Rufa nibble on your feet, eating dead skin as they go. David and Mat were really into doing it and while I was a bit hesitant I didn’t want to be the only one not to participate, so I joined in. 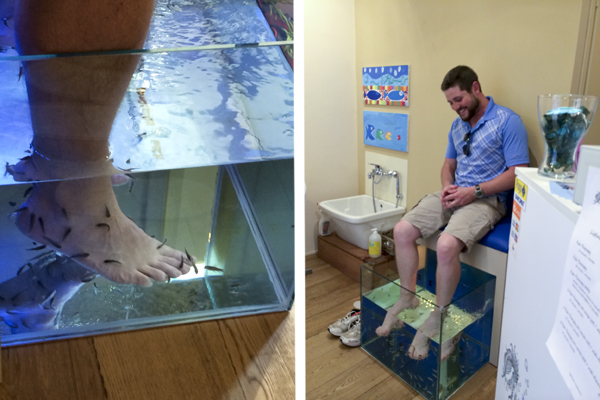 Our feet were almost unbearably ticklish at the beginning but once we got used to the little fish nibbling on our toes, it actually felt pretty good. I don’t know if it is something I would actively seek out, but it was a fun little experience. I still can’t believe we did this!